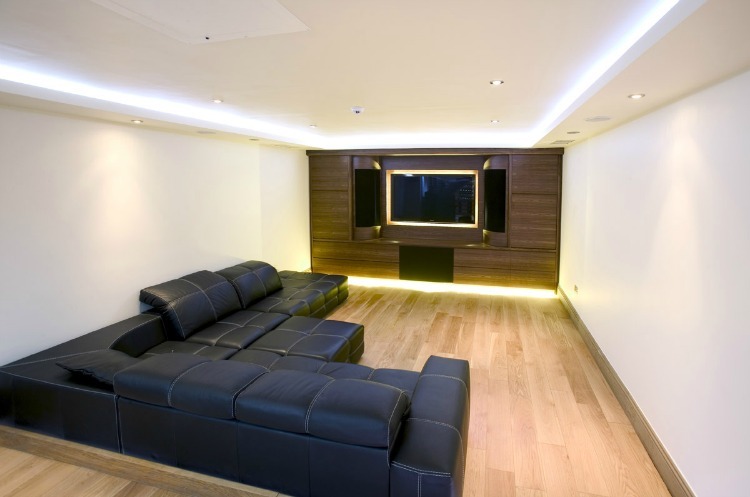 Home theatre design is a space where you can have a television or LED which gives entertainment. See that if you design a home theatre the walls should be sound proof so that you can avoid creating any disturbance to the neighbors. It is not compulsory to have a home theatre area because most of the people arrange a television unit in a living room or in lounges and it is based upon a person. If you love to have a home theatre at home itself then you can allot some place or area in your home to design a home theatre. Here are some well designs to choose for your home theatre interior. These images give you an overall idea how to design a home theatre and what are the things which are included in the interior. Basically for designing of the interior you need to have some couches, television, speakers, closets if required and can be decorated with the draperies, different false ceilings, wall lamps, carpets. The image shows you a home theater design which has a cozy look. The carpet laid in the room is majestic carpet which is thick and dark brown in color. The room is designed simple but looks elegant because of the earthy colors used for painting and in contrast with the cream, a dark chocolate color is used which is a great combination. The draperies used here are pelmets which looks like sunrise orange and adds a dramatic effect to the room. The screen is also large and good enough for looking a picture where you can feel as if you are in that area. In the view of this image you can see a modern home theatre design. The room looks completely awesome with the sofa which is a Lamont sofa and is a ultra modern leather sectional sofa with a plush spruce cushion. There are two coffee tables which are steppe trunk table and has a flower pot which gives a fresh look to the entire room. The flooring is made with the hardwood white oak flooring which makes you to feel comfort when you walk. In the image you can see Tab top curtains which looks bright and are decorated to the picture windows and we can view the outdoor area. The false ceiling is dry wall ceiling which has a massive chandelier attached to the roof and the television unit is designed well and looks amazing. This image views a modish and contemporary design of a home theatre. The interior is decorated with the ashy walls and television space is designed with a wall ceiling and has a closet made of wood for placing speakers. It looks sophisticated with all the knick knack things on the closets. If you have allotted small space for your home theatre room you can go with this design which is modern and gives comfort by the couches for seating. The room has Casement windows where you get sunlight but can be covered using thick vintage style draperies. The flooring is made with the wood and has a carpet which is textured and is eye catching. 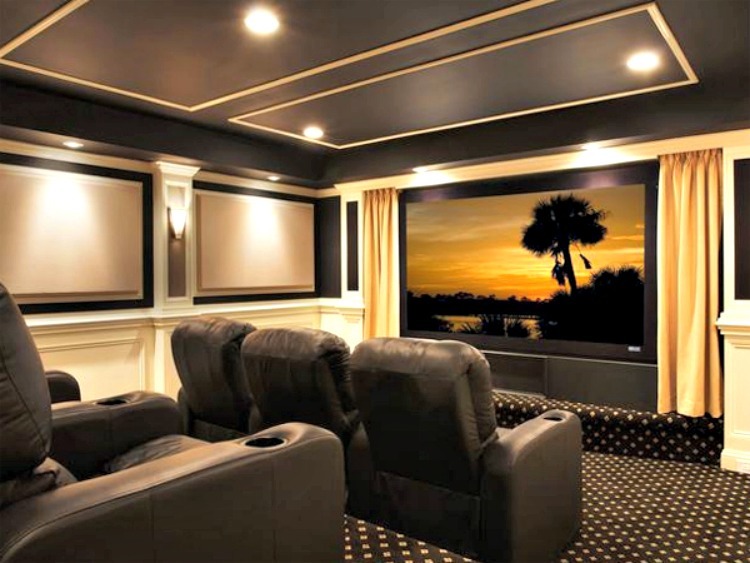 This design of home theatre is traditional and has plenty of seating arrangement where a family can get entertained. This room is decorated with the wood stripes behind the television and beige soft for the entire wall in the room. the flooring is made with the ceramic tiles. The false ceiling is Pallet ceiling where wood is suspended along with the lights and is looking good. The rocca clan round table is placed where you can decorate it with flower pots. The room has leather couches which are comfy and the room has many closets to decorate with display items or accessories and has lamps. There are cabinets for placing messy things or to store materials. In the view of the image you can see a fabulous home theatre design which is simple and luxurious in its look. The interior is plain and is painted with white color and the false ceiling is also dry wall plain ceiling with few lights. The interior is decorated with the wooden cabinets and has placed a television in it which looks classy. 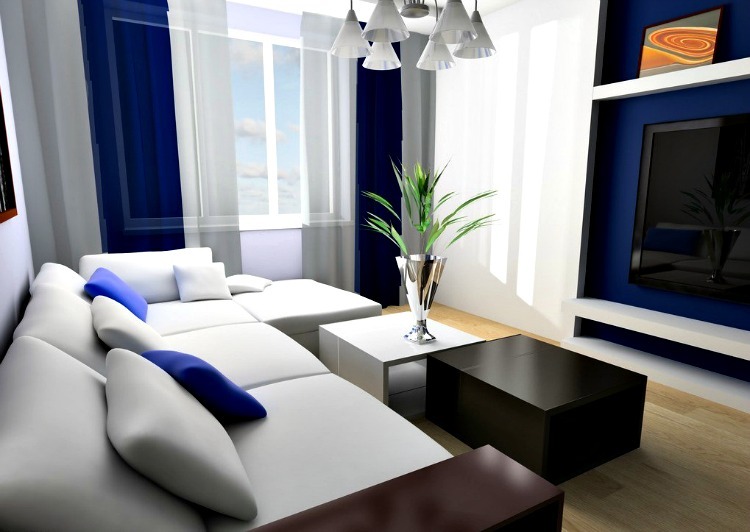 The room does not have any extravagant materials and can avoid reverberation when you are watching television. The sofa is ultra modern blank bonded leather sectional sofa and looks swanky. In the view of this image you can see a bright and colorful home theatre design. The interior is decorated with the stunning false ceiling with led lights. The room is simple which decorated with the television and speakers underneath it and has wall lamps around the interior which gives a dramatic texture. There are couches which are made of leather and wood. It also has two Grainger chairs for seating. The summer citrus color decorated to the interior is adding beauty and the flooring has a carpet which is a stain master rug and gives comfort to your barefoot when you walk. In the view of the image you can see a simple and modish design of a home theatre. 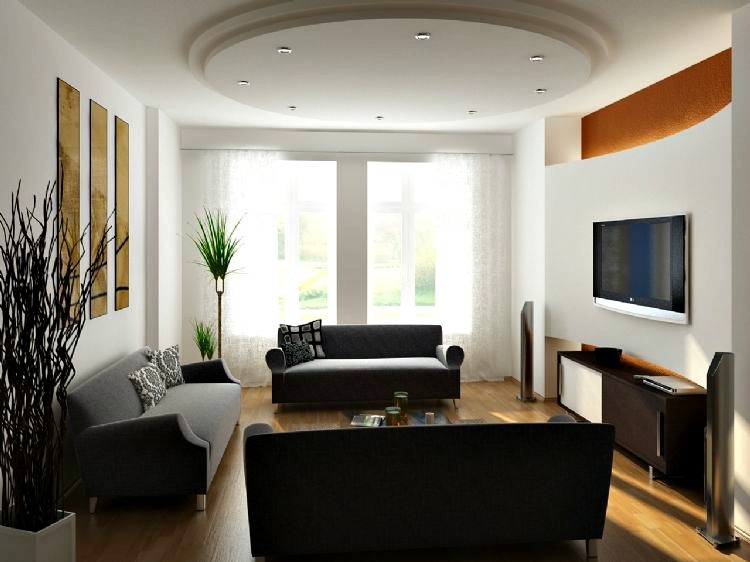 The interior is decorated with the white colored walls which looks elegant and has decorated with the ceiling behind the television and has speakers. 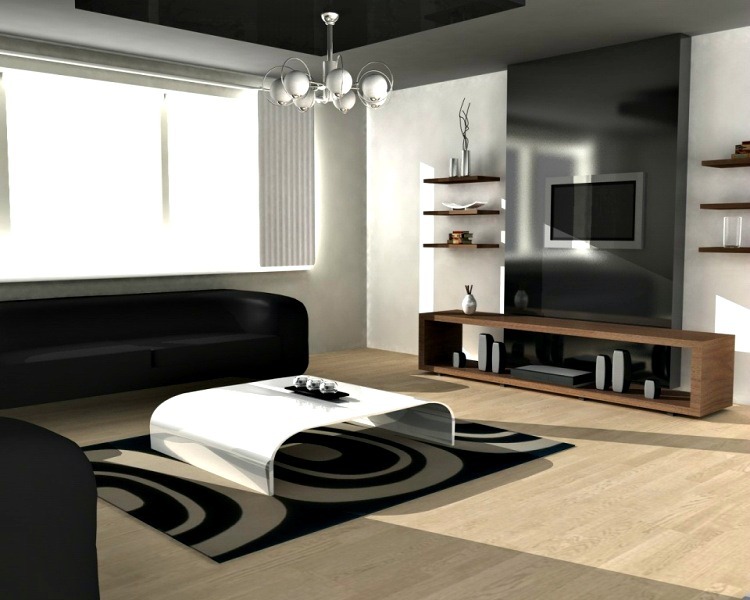 It has masculine dark wood coffee table which is sprucing and the sofas used are ultra modern contemporary sofa set. The interior also has indoor ornamental plants which gives a fresh look and creates a calming environment. The flooring is made with wood which is quite popular now a days and the room has spiral staircase to go upstairs. This design is well suited if you are planning for a duplex house. In the view of this image you can see a well designed home theatre interior. The room is simple with the stylish grey sofas in contrast with the white walls which is decorated with the ceiling of saturated colors and is adding a fab look. The flooring is laminated hardwood flooring. It has a coffee table where you can place edible items or you can have casual drinks. The interior is decorated with the casement windows where you can view the exterior environment and it has covered with the sheer curtains but you can use thick curtains if you do not like sun rays coming in because sheer curtains are very delicate which are made of sheer fabric. In the view of this image you can see it is baronial and is well designed home theatre. The interior is decorated with earthy Beige soft color and has wall cladding made with the wood where television is placed. As there is lots of space you can arrange for more seating using couches, sofas or chaises. Here the couches are modern and comfy with the sprucing pillows of the entire home theatre set. The room is decorated with the draperies which are think and avoid resonance in the room from the outdoor. The flooring is made with plane vinyl which looks foxy. In this image you can see a beautiful interior of a home theatre. The false ceiling is dry wall ceiling with the lights. The entire interior is decorated with earthy colors and has a fire place to create a warming environment and has a stone wall cladding around it. The room has a leather sectional sofa with brown colored cushions and it has a centre table for decoration of pots or to place food items, casual drinks. The interior has a big television where you can a have a clear picture of the broadcast. It has a closet where ornamental plants are decorated to create a dramatic effect. The flooring is made with the hardwood laminate.